Made in the USA, the "Outdoorsman" is the perfect knife for any adventure. The 5 inch blade features a clipped point curve and proper gauge for filleting and skinning. This is a time proven design that is ideal for fishing, hunting and camping. We’ve taken this classic design and updated it with modern Stainless Steel and beautiful hand polished wood handles. The knife also comes with a durable leather belt sheath. This is the perfect knife for the outdoorsman or woman in your life. 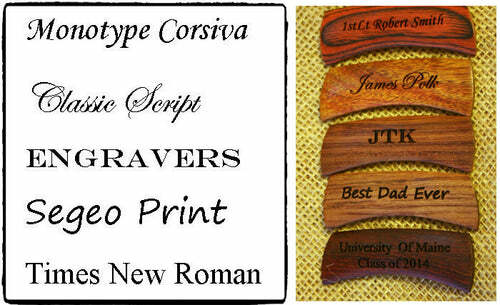 Add custom engraving to make this the perfect gift, up to 24 characters. Hand polished wood handle. Please note, actual color of the knives will vary slightly due to the natural coloring of the wood.